In a recent interview, Becky Lynch addressed the ending of her historic WrestleMania main event matchup. Becky Lynch came away from WrestleMania 35 with both the RAW Women’s Championship and the SmackDown Women’s Championship. Her historic victory has earned her the nickname Becky Two Belts. The matchup, however, wasn’t without a little controversy. In particular, the ending of the match which saw Lynch pinning Ronda Rousey with a crucifix pin. The only problem? Rousey’s shoulders coming off of the mat during the final count. Speaking with Gorilla Position, Becky Lynch addressed the finish of her ‘Mania main event match up. She would go on to dismiss the idea of unifying the belts, wanting to defend both instead. 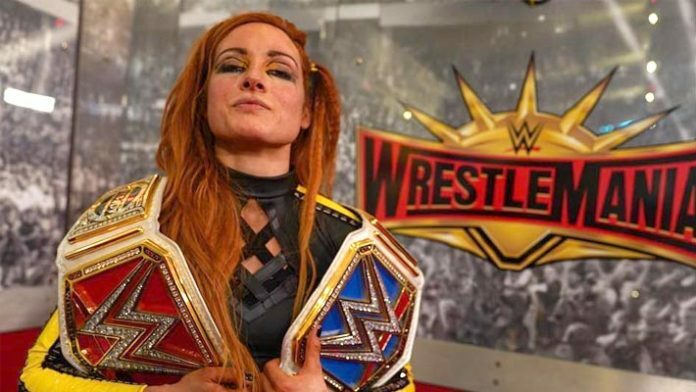 Since her victory at WrestleMania 35, Becky Lynch has celebrated her victory on both RAW and SmackDown. Both occasions, however, were interrupted by Lacey Evans—setting up a potential feud for the two going forward.